Mirri Sparkle paper adds a fun twinkle to any paper craft project. 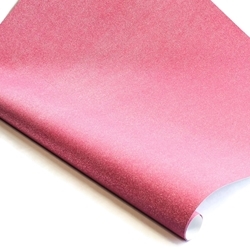 This shiny metallic pink paper has a smooth texture and is glitter free. Each sheet of Pink Sapphire Mirri Sparkle Paper casts a pastel pink shimmer across the entire sheet. The paper weighs 140 gsm and can be used in offset printing, but it is not inkjet or laser printer compatible. Enjoy large sheets measuring 24.5" x 35.25" or smaller 12" x 12" and 8.5" x 11" sheets. 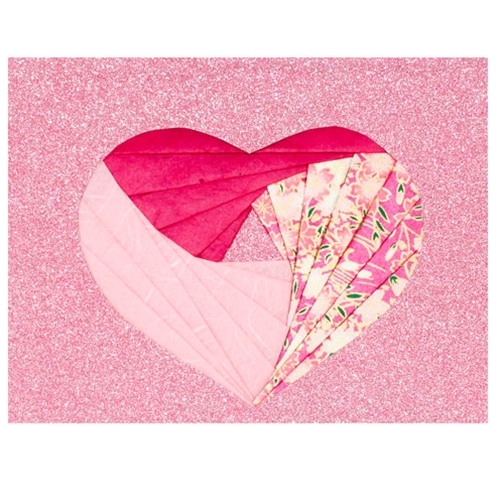 This pretty-in-pink note card uses Mirri Sparkle paper and other Mulberry Papers in the iris-folding technique to create a unique heart-shaped design.